The Monster Hunter series wasn't always the "monster" (heh heh) hit it is currently. Originally released for the PS2, the first game, Monster Hunter, and its sequel, Monster Hunter G, sold less than a million copies each. It wasn't until the game went hand-held to the PSP with Monster Hunter Portable (Monster Hunter Freedom in the west) that Capcom scored their first million seller with the series. There is, however, something to be said about the fact that the game series helped cement the PSP's popularity in Japan among the previous generation of handhelds (so much so that the PSP continues to outsell the PS Vita) as well as establish the popularity of the 3DS in the current generation of handhelds in Japan. Why does the series garner such popularity mainly in Japan? The game's system itself is not unique. It largely echoes the Phantasy Star Online quest/mission model. Still, with Capcom's action game and graphics knowhow mixed with a more relatable semi-realistic game world (i.e. all players are human, no level system, heavy emphasis on action, all attacks are physical with no real magic other than buffs in the form of potions or meat… (Although, show me a real life video of a man whirling around a ship anchor to fight a sperm whale and I might concede that Monster Hunter is "realistic. ")), and a Skinner-box reward system, you've got yourself a well-put-together game. Add a dash of cute cat-like mascot and you've got a winner. Capcom was also able to make the game more accessible to players by having the multi-player be, for the most part, free (The original games for the PS2 required a monthly ¥900 (US$10.19) service provider subscription and the Wii versions require the purchase of 30 day, 60 day, or 90 day tickets… Another argument for why the portable versions are more popular). Another, and perhaps the biggest factor in the strength of the Monster Hunter series, is Japan's sense of community. Due to the nature of the game's multi-player system, particularly with the PSP and 3DS, when playing with others, you will almost invariably be playing with someone you know—more often than not, a friend. Most people seem to get their introduction to the game from the people around them. "My boss talked me into playing [Monster Hunter 3rd]" says Ryouhei, a 24 year-old clerk who would spend hours after work huddled together with his co-workers. "It's fun to work together with friends towards a mutual goal." The fact that friends are playing the game acts as an incentive for people to join in as well as keep playing. In Japan, a country with imperial origins, there is often enormous pressure to fit in in communities. When something is popular among one's peers, it's best to get in on the action, or at the very least know what all the hubbub is about. While this mindset has lessened in the years of democratic rule, it remains embedded in a large part of society. "On a trip with 15 or so colleagues, everyone but me was playing Monster Hunter on their PSPs." Kenji, a 25 year-old actor recalls, "I sat in the corner playing Final Fantasy on my PSP, while everybody else sat in circles of 3 or 4 laughing and having fun… It was terrible. When I got home, the first thing I did was get a copy of the game." Monster Hunter is pretty much tailor-made for hand-held consoles. This could be part of the reason why it has not caught on as strongly outside of Japan. Portable systems are much stronger sellers in Japan than in other regions. This could be attributed to several factors; the dense population leading to the development of smaller consoles with equal, if not higher performance levels than older, larger versions, and the abundance of mass transit, leaving large portions of the population with very little to do during the long train/bus rides to and from school/work. Another part of why the game is more popular in Japan probably has once again to do with the sociological aspects of the game's multi-player. In Japan, playing multi-player Monster Hunter is a form of social interaction. You're not playing to get better equipment, you're playing to have fun and to socialize with the people you're playing with. I asked several people about their experiences with Monster Hunter while preparing to write this article, and a couple of interesting points crept up. Firstly, I could not find a single person who started the series on their own. Everyone seemed to have been introduced to the game series through someone else, be it a colleague or friend's suggestion, or simple peer pressure from watching friends enjoying the game. While I'm sure there are people who picked up the game on their own, they seem to be quite rare. The second point of interest was when I asked people what they enjoyed about the game. No matter what reason was given, invariably, the words, "-with my friends/colleagues" came at the end. Everyone had their varying basic reasons for liking the games, but the crux of their enjoyment came from playing with someone else. Now, there are many games out there that are basically multi-player games with brief single-player campaigns tacked on, but Monster Hunter is a true chameleon in this respect: the game doesn't sell itself as a multi-player game. Looking over the promotional videos for most of the games in the series, very little screen time is ever devoted to the multi-player. Ratio-wise I'd say less than 10% of the imagery shows more than one player in action at the same time. From a distance, most of the game series' promotional material seems to almost downplay the multi-player. 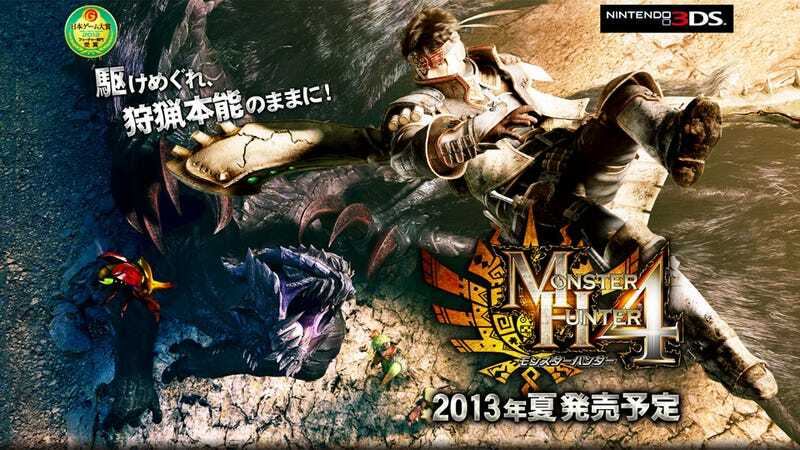 Even the cover of the games all show a lone hunter standing up against a giant monster that towers over them (The only game that goes counter to this formula is the online game Monster Hunter Frontier Online). Focus on graphics and single-player for a game that is crippled without its multi-player… I don't know if it's on purpose, but it seems counter-intuitively genius. With Monster Hunter, the goal is multi-player. While most non-competitive multi-player games have multi-player as a means to achieve a mutual goal, with Monster Hunter the goal IS multi-player, cloaked in the superficial objective of fighting giant monsters to hopefully get ingredients for better equipment. Monster Hunter is a truly "social" game (or rather, a "social interaction" game) in the guise of an action game. Playing alone, the game feels aimless. Sure, the gameplay is well-designed and solid, but without someone to share it with, the experience feels hollow. This is why the game's single-player is so weak, and this was the reason why I initially stopped playing the game shortly after first picking it up with no one to play with (I started back up when I found a group of friends to play with). This is also pretty much why the game struggles outside of Japan. Like it or not, gaming is still largely viewed as a solitary pastime with interactions between people only occurring over the internet (You won't find groups of friends sitting around a table in a restaurant or fast food joint playing hand-held video games together in many other countries outside of Japan). This, and the fact that most of the Monster Hunter games for hand-held consoles released outside of Japan have been for the PSP, a console that gets half of its sales numbers from Japan alone, is a formula for trouble. The upcoming western release of Monster Hunter 3 Ultimate for the 3DS in March could hopefully change that, however (Although the need for the Circle Pad Pro to fully exploit the game's potential worries me).